The Mercedes-Benz plant in Düsseldorf is making intensive preparations for the market launch of the next-generation of the Sprinter. The company management and the works council have now agreed that the electric-drive Sprinter will also roll off the production line in Düsseldorf, the lead Sprinter plant worldwide. This forward-looking decision will boost the competitiveness of the location and secure employment. Helmut Stengel, Chair of the Works Council at the Mercedes-Benz plant in Düsseldorf: “For the works council and the workforce at the Düsseldorf site it is important that the electric Sprinter is integrated into the production alongside the conventional vehicles. The agreement is a decisive milestone in the ongoing development of our site thanks to new technologies, and sets our Sprinter plant on course for a successful future. Over the next few years Mercedes-Benz Vans will be investing a total of around 150 million euros in electrifying its commercial range, based on the Vito and the Sprinter. The business unit can make use of existing modular construction technologies deployed by Mercedes-Benz Cars and benefit from economies of scale. 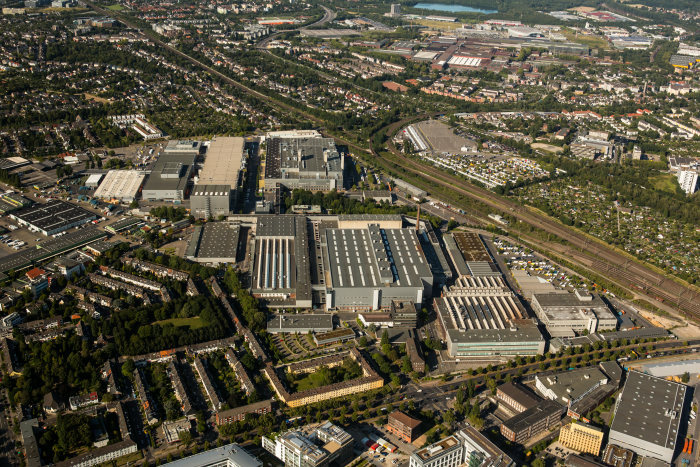 At the Düsseldorf plant around 300 million euros are being invested in the production of the next-generation Sprinter. The relevant employees are undergoing training to prepare for work on the electric Sprinter and other technological developments. The company and the works council have also agreed to carry out measures to increase flexible working and boost efficiency. The first major commercial customer for electric vans from Mercedes-Benz has already been confirmed: as Mercedes-Benz Vans and trading and logistics provider Hermes announced a few weeks ago, Hermes Germany will, as part of a strategic partnership, be deploying 1500 Mercedes-Benz electric vans for its parcel deliveries in the coming years – including vehicles from the Sprinter model series. At the beginning of the 1960s, the company, at that time Daimler-Benz AG, took over the Düsseldorf plant from Auto Union. The manufacture of Mercedes-Benz vans began in Düsseldorf on 1 April 1962. The Mercedes-Benz Sprinter has been produced in Düsseldorf since 1995. Shortly after its launch, annual production broke the 100,000-van barrier for the first time, with record after record being broken ever since. In 2015, the Sprinter celebrated its 20th birthday in Düsseldorf and also by far the most successful year in its history. In 2016 the large van followed on seamlessly from this record level with a total of around 193,400 units sold worldwide. The Sprinter established the eponymous large-van segment and has dominated it ever since. It is available in over 130 countries and has now sold well over three million units, making the Sprinter one of the most successful commercial vehicles of all time and a best-seller in the Daimler product portfolio. The Düsseldorf plant is currently making intensive preparations for the start of production of the next-generation Sprinter. Substantial restructuring and modernisation is already underway. Mercedes-Benz Vans manufactures the Sprinter at a total of six plants around the entire globe. As the only manufacturer in the large-van segment, the business unit will continue to produce the next generation in Germany.